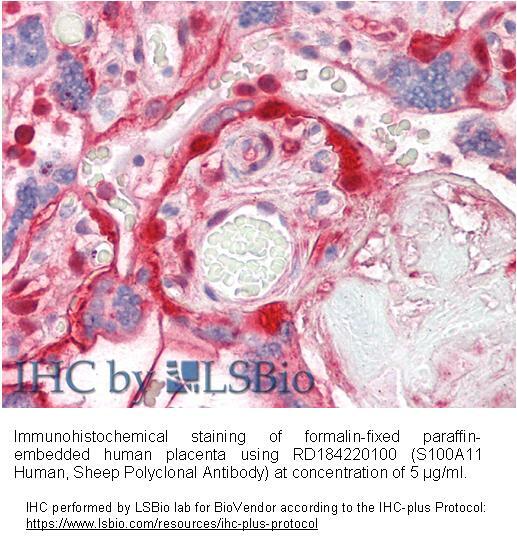 The antibody was raised in sheep by immunization with the recombinant Human S100-A11. The immunization antigen (12.98 kDa) is a protein containing 115 AA of recombinant Human S100-A11. N-Terminal His-tag, 10 extra AA (highlighted). Immunoaffinity chromatography on a column with immobilized recombinant Human S100-A11. 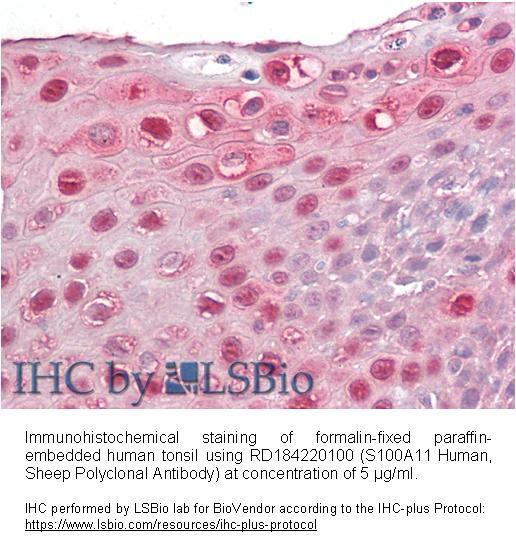 S100A11 (S100C; calgizzarin) was first isolated from chicken gizzard smooth muscle. Human homologue was later identified in human colorectal cancer cells and in colorectal normal mucosa, with much higher expression in the cancer cells. S100A11 is a member of the S100 family of proteins containing 2 EF-hand calcium-binding motifs. The polypeptide chain consists of 105 amino acid residues giving molecular weight of unmodified monomeric protein 11.74 kDa. Disulphide bridge linking two monomers in the dimer via Cys-11 residues was found in its structure. The protein can be phosphorylated on some residues from which at least phosphorylation on Thr-10 causes significant structural changes. S100A11 binds to annexins A1 and A2, the DNA-dependent ATPase Rad54B, p53 and RAGE. It was proposed that up-regulated chondrocyte expression of S100A11 (as RAGE ligand) in OA cartilage and RAGE signaling through the p38 MAPK pathway promote inflammation-associated chondrocyte hypertrophy. RAGE signaling mediated by S100A11 thereby might have the potential to contribute to the progression of OA. S100A11 has also been shown to be secreted and to exert RAGE dependent signaling in human keratinocytes. S100A11 was found in many different human both normal and cancer tissues. S100A11 appears to play distinct roles depending on the tumour involved. In bladder carcinoma or renal carcinoma expression is related to tumour suppression however in prostate cancer, breast and pancreatic cancer S100A11 is thought to be a tumour promoter. S100A11 has been also indicated as one of potential biomarkers of infective endocarditis.